Though the Constitution said nothing about an inaugural address, Washington, in an innovative spirit, contemplated such a speech as early as January 1789 and asked a “gentleman under his roof ”—David Humphreys—to draft one. Washington had always been economical with words, but the collaboration with Humphreys produced a wordy document, seventy- three pages long, which survives only in tantalizing snippets. In this curious speech, Washington spent a ridiculous amount of time defending his decision to become president, as if he stood accused of some heinous crime. He denied that he had accepted the presidency to enrich himself, even though nobody had accused him of greed: “In the first place, if I have formerly served the community without a wish for pecuniary compensation, it can hardly be suspected that I am at present influenced by avaricious schemes.” Addressing a topical concern, he disavowed any desire to found a dynasty, pleading his childless state. This ponderous speech never saw the light of day. 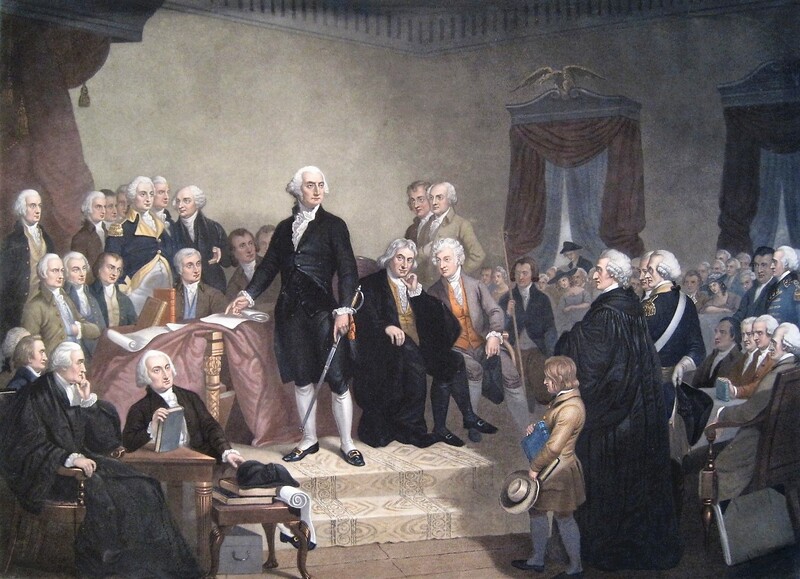 Washington sent a copy to James Madison, who wisely vetoed it on two counts: it was much too long, and its lengthy legislative proposals would be interpreted as executive meddling with the legislature. Instead, Madison drafted for Washington a far more compact speech that avoided tortured introspection…. The sole constitutional requirement for the swearing- in was that the president take the oath of office. That morning a congressional committee decided to add solemnity by having Washington place his hand on a Bible during the oath, leading to a frantic, last- minute scramble to find one. A Masonic lodge came to the rescue by providing a thick Bible, bound in deep brown leather and set on a crimson velvet cushion. By the time Washington appeared on the portico, the Bible rested on a table draped in red velvet. The crowd grew silent as New York chancellor Robert R. Livingston administered the oath to Washington, who was visibly moved. As he finished the oath, he bent forward, seized the Bible, and brought it to his lips. Washington felt this moment from the bottom of his soul: one observer noted the “devout fervency” with which he “took the oath and the reverential manner in which he bowed down and kissed the Bible.” Legend has it that he added “So help me God”…. As Washington began his speech, he seemed flustered and thrust his left hand into his pocket while turning the pages with a trembling right hand. His weak voice was barely audible. Fisher Ames evoked him thus: “His aspect grave, almost to sadness; his modesty, actually shaking; his voice deep, a little tremulous, and so low as to call for close attention.” Those present attributed Washington’s low voice and fumbling hands to anxiety. “This great man was agitated and embarrassed more than ever he was by the leveled cannon or pointed musket,” said Senator William Maclay…. In the first line of his inaugural address, Washington expressed anxiety about his fitness for the presidency, saying that “no event could have filled me with greater anxieties” than the news brought to him [that the electors had chosen him as President]. He had grown despondent, he said candidly, as he considered his own “inferior endowments from nature” and his lack of practice in civil government. He drew comfort, however, from the fact that the “Almighty Being” had overseen America’s birth: “No people can be bound to acknowledge and adore the invisible hand, which conducts the affairs of men, more than the people of the United States”…. Setting the pattern for future inaugural speeches, Washington did not delve into minute policy matters but outlined the big themes that would govern his administration, the foremost being the triumph of national unity over “local prejudices or attachments” that might subvert the country or even tear it apart.